Vancouver led the way in building the most rapid transit over the last 20 years but still has the lowest rate of ridership, according to a new report analyzing transportation infrastructure in major Canadian cities. The Pembina Institute compared transit networks in Canada's five largest cities: Montreal, Ottawa, Toronto, Calgary and Vancouver. It included subways, SkyTrains, light rail, streetcars and express buses. It found that Vancouver opened up 44 kilometres of new lines of rapid transit over the past two decades, about one-third more than Calgary with 29 kilometres, and double the length of lines Toronto opened in the same period with just 18 kilometres. The past two decades have seen Toronto add 87 kilometres of express bus lines, which is twice the amount added in Vancouver (38 kilometres) and five times the amount in Calgary (16 kilometres). Pembina says that Montreal and Ottawa haven't added express bus lines since then. Vancouver was behind both Toronto and Montreal in terms of access, measured by the percentage of residents who lived within walking distance of rapid transit. Just 19 per cent of Vancouver residents lived within a kilometre of rapid transit, compared with 37 per cent for Montreal and 34 per cent for Toronto. Toronto has the highest ridership rate per capita with residents taking 133 rapid transit trips per year on average, compared to Vancouver, which was last with just 52 annual trips per capita. Gordon Price, a transportation expert and urban planner at Simon Fraser University says Montreal and Toronto invested in subways in the 50s and 60s and those cities are now seeing the benefits of having the highest number of transit users in the country. "We built our major metro transit in the 80s, Calgary is now doing it. It will take a few decades to catch up, but overall we are going in the right direction." 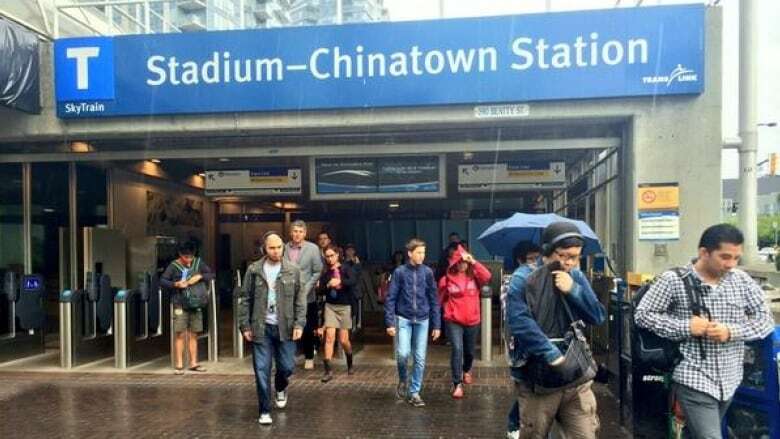 Translink CEO Ian Jarvis said there has been noticeable increases in transit users and car commuting trips to downtown Vancouver by single occupancy vehicles are down. "Half a million of people have come into the region and we have managed to keep travel times, commute times consistent. There are certainly objectives around people living closer to corridors." Toronto's airport train: How would our fare compare?